Robert Bathurst’s unnamed character in The Song of Lunch is a man who wishes he could turn back time. A stuffy older white man, working in the publishing industry and determinedly inhabiting a fantasy London in which he can still brush shoulders with literary greats in the streets of Soho, he has summoned his ex from her comfortable life and family in Paris to meet with him for lunch in an old trattoria. What is he hoping for? Pleasant reminiscences on old times? To rekindle their lost love? As lunch progresses and the Chianti bottles empty, the Publisher’s defenses are slowly stripped away under his companion’s mercilessly incisive gaze, and we see the foibles of his psychology laid bare. 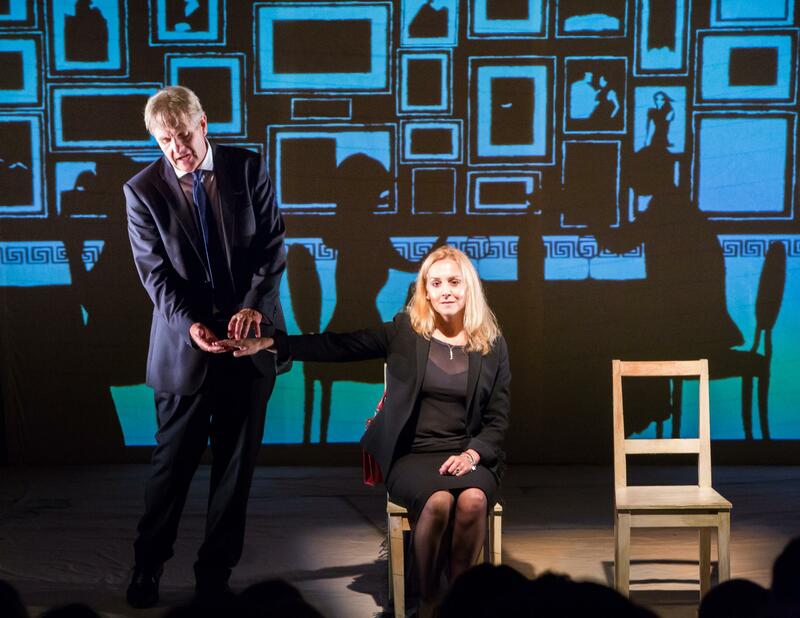 This play is staged in the tucked-away and packed-out Pleasance Forth theatre, and its audience comprises almost entirely of older middle-aged theatregoers who recognise Robert Bathurst from Cold Feet and Downton Abbey. 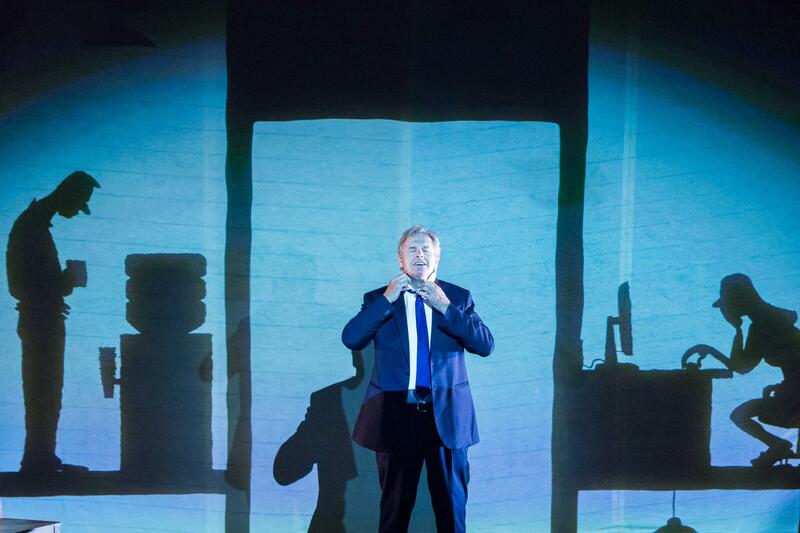 The simple, rhythmic elegance of its lyrical writing and the minimalist staging – supported by gorgeous animations by Charles Peattie – feels a world away from the raucous variety of attention-grabbing artistic gambles which characterise usual Fringe shows. Like the haute cuisine enjoyed by its characters, this play appears light and bite-sized on the surface, but has layers of subtle complexities and flavours which mean that the subsequent analytical discourse forms half the pleasure. I feel that I would need a whole essay to unpack the meaning of this piece, in an operation as delicate as the lady character’s dissection and consumption of her sea bass. If pressured, I would summarise thus: this story is about an individual’s (or a country’s? An empire’s? A social class’s? A gender’s?) inability to accept that, through his own failings, the sun is setting on his glory days and a new era is beginning to dawn without him. Rather than taking responsibility for his shortcomings and adapting to make the best of the changing times, he clings desperately to an unattainable and rosy-filtered image of the past. Like Orpheus, in succumbing to the temptation to look backwards instead of forwards, he throws away the chance of a brighter future. All the talk of tragedy and pathos aside, this play is also incredibly witty and had the audience chuckling and chortling both with and at the charming yet pathetic Publisher. Rebecca Johnson as the “old flame” is also wonderful, embodying poised self-confidence and providing an empathetic yet no-nonsense balance to the narrator’s self-indulgence (the golden tones of her hair and the warm lights she is often bathed in provide welcome relief from Publisher’s cooler, almost anaemic colour scheme). The playbill includes a note from the playwright which suggests that, though originally intended to be a ‘piece of pure comedy, a light farce’, during the writing process the play had found its own, darker shape, in a process of which he ‘was only partially aware’. This is evident from the contrast between the light, optimistic, playful mood of the beginning in contrast to the somewhat bleak ending, and the piece’s tangled deeper meanings (teasingly self-parodied when the Flame suggests a convoluted counter-interpretation to the Publisher’s poetry, and is met by a blank response of ‘…you’re going to have to run that past me again’). However, this very vulnerability of the piece is what lends it its charm: beneath all the witticisms and self-deprecation, this play provides a glimpse of someone who is disappointed in their past and scared of their future… I think all of us, at some time in our lives, can relate to that.